OTTAWA -- Canada and the United States will restart high-level talks Tuesday on the North American Free Trade Agreement as Foreign Affairs Minister Chrystia Freeland returns to Washington in hope of making progress on stubborn differences. Freeland and her counterpart, U.S. Trade Representative Robert Lighthizer, left the bargaining table Friday without a deal following two weeks of what Freeland described as intense, but productive, negotiations. The trip to the U.S. capital is expected to be short. 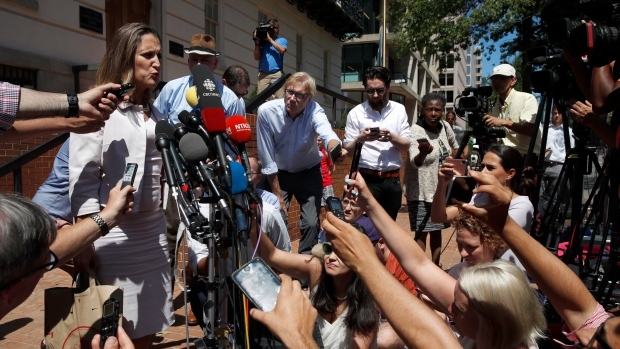 Freeland's scheduled to attend the Liberals' caucus retreat Wednesday in Saskatoon and it is unclear whether she will return to Washington late in the week. 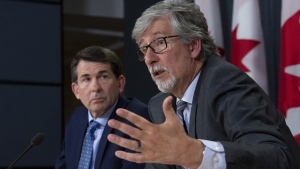 The two sides have so far been unable to break through an impasse over, among other issues, U.S. access to the Canadian dairy market, a cultural exemption for Canada and the Chapter 19 dispute resolution mechanism. The 24-year-old NAFTA, which also includes Mexico and is integral to the continent's economy, has been under renegotiation for 13 months. The top players, Freeland and Lighthizer, were away from the bargaining table Monday, but negotiators continued their search for common ground on a NAFTA 2.0. Freeland appeared at a women's summit Monday in Toronto, while Lighthizer was overseas to meet with European Union Trade Commissioner Cecilia Malmstrom. After emerging from her meeting with Lighthizer on Friday, Freeland said the negotiations had entered a "very intense" phase during which officials have been meeting "24-7." Freeland said she would meet with Lighthizer when negotiators found issues that needed to be elevated to the ministerial level. She's declined to discuss specifics about the talks and has said she and Lighthizer have an agreement to refrain from negotiating in public. Prime Minister Justin Trudeau has said Canada could be willing to be flexible on dairy. But Larry Kudlow, the director of U.S. President Donald Trump's National Economic Council, suggested Friday that Canada isn't offering enough. Trump added a layer of urgency to the negotiations late last month after announcing his deal with Mexico. His announcement came with an ultimatum for Canada -- join the U.S.-Mexico pact or suffer the consequences of punishing American tariffs on the auto sector. He also warned that the U.S. and Mexico would move forward bilaterally without Canada.